Since 2004, The Brides’ Project has been providing brides with affordable dresses, and donating all their profits to support cancer charities. If you’ve got a wedding dress you don’t know what to do with, consider donating it here. This program has been in place since 1985, and is a great option for clothes donation. They can pick up donations right from your door, or you can locate a Clothesline drop box on their website if you prefer to drop it off. Covenant House Toronto is Canada’s largest youth shelter. Because of limited storage space, they’re only accepting new / unused clothing donations at the time of writing. They also advise that they have a much greater need for boys clothing than girls clothing. See their site for a list of items they’re looking for. These two non-profit organizations support men (Best) and women (Success) looking for work by providing professional attire, a network of support and the career development tools to help them succeed at work. Donate any used clothing that you would wear to an interview and help someone gain their financial independence. The Fort York Food Bank accepts more than just food. Clothing you donate to them will be distributed to people at their Community Drop-In Centre. Jessie’s Centre helps pregnant teens and young mothers to find safe affordable housing, access comprehensive health services for themselves and their babies and to complete their high school education. They accept clothing for young women, babies as well as baby gear and supplies, although some of these items are fully stocked until February 2017. Check their site for more details. Another great charity you might want to consider for your clothes donation. They have donation boxes as well as offices where you can drop off your clothing, as well as home pick up. New Circles helps low-income families and operates GLOW, Toronto’s largest clothing bank. They accept clothing and accessories only. Check their site for their donation guidelines. Like the Clothesline program from the Canadian Diabetes Association, the Ontario Federation for Cerebral Palsy (OFCP) can come to your home to pick up your clothes donation. They also accept other goods too, so have a look at their website for more information. All donations are sold (at the time of writing) to Value Village. The proceeds from the sales go to support the OFCP. All of the items you donate to the Oasis clothing bank are either given to participants in the Oasis Addiction Recovery programs, or sold to partly fund the programs they offer. Many of the people in the recovery program cannot afford simple necessities and are making an effort to reintegrate back into society. Parkdale’s Community Drop-In accepts adult clothing of all types but are especially on the lookout for coats, shoes and boots, socks and underwear. The clothing is put into their clothing bank and distributed to members in need. Pegasus accept clothing as well as other goods at its thrift store in Toronto. The profits made from sales of these items are put towards the Pegasus Community Project for Adults with Special Needs. The Really Really Free Market is a pop-up where you can donate, as well as pick up, goods and services. Have a look at their website for donation suggestions and for the next pop-up date. Other than administration and fundraising costs, the proceeds from sales at Salvation Army Thrift Stores go towards supporting the programs and services provided by them. This includes, among others, food banks, shelters, children’s camps and addiction treatment facilities. Yonge Street Mission has over 100 programs and services. Their goal is to end chronic poverty in Toronto in one generation. Among the many types of donations they accept are clothing donations. These are sold in their thrift store Double Take, whose profits are used to help fund their programs. Value village is a for-profit thrift store, but they support charities by buying your donations from them. They will accept your clothes donation in-store on behalf of their non-profit partners and what’s more, unsold items are recycled or sent to developing countries. See their site for a location near you. If your clothing is far too worn, stained or otherwise damaged, you can still recycle them rather than throw them in the trash. While it may not be as simple as throwing your old clothing in the blue bin, it’s gotten much easier with cities and retailers taking part. Listed below are some of your options in Toronto and the GTA, as well as elsewhere in the world. Markham, together with the Salvation Army, has just introduced a textile recycling program for all the textiles you can’t donate! Even stuffed toys are accepted at the drop-off boxes located at fire stations as well as at recycling depots. See their website for a full list of locations. Partnering with I Collect (I:CO), American Eagle started their textiles recycling program in 2013. Originally limited to staff only, it was expanded in 2014 to include customers. 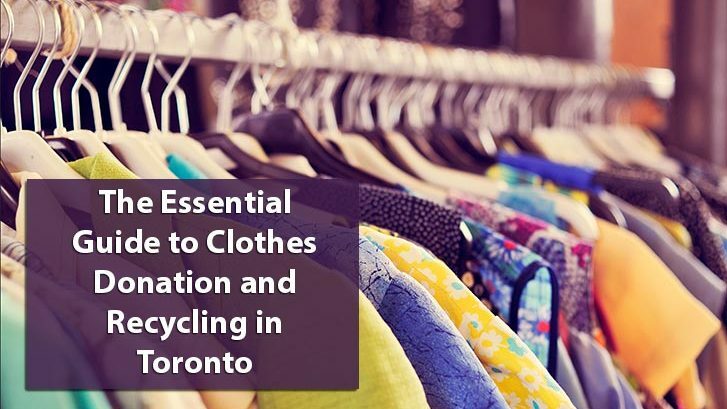 They accept clothing from any brand in any condition for recycling at all of their stores. Like American Eagle, H&M has partnered with I:CO to recycle textiles. You can drop off clothing, regardless of its brand or condition at any of their locations across the globe. North Face also accepts clothing for recycling in any condition from any brand at some of their retail locations. The proceeds from their recycling program go to the Conservation Alliance to help protect shared wilderness and recreation areas. Puma’s recycling program is limited to only a few their locations, but still a great option if you live close to or frequent the Heartland Town Centre, Dixie Outlet Mall, Toronto Premium Outlets or Outlet Collection at Niagara. Like the previous retailers, they accept all clothing from all brands in any condition. Recently opened in Toronto at Yorkdale and Eaton Centre, Uniqlo accepts only their own brand of clothing at any of their stores worldwide. So far, we’ve primarily covered donations and recycling as the main options for disposing of your old or undesired clothing. We understand, however, that sometimes it’s hard to bear the thought of donating or recycling a perfectly good pair of expensive designer jeans just because you had ten too many Flakies every morning. The obvious way to recoup some of your investment is by selling your clothing online through eBay or Kijiji. This can be time consuming if you have a lot of items to sell, however, so consider choosing companies like the KindExchange and CommonSort instead. Bring all your quality undesired clothes to them and they’ll appraise them and give you cash on the spot. If you have a little more patience and a much bigger investment in the clothes you’re parting with, consider consignment. A quick search on Google will yield a large number of results for stores that will sell your clothes for you and typically have a higher return than cash-for-clothes companies do. Until we started doing our own research into options for our clothing cast-offs, we had no idea that there were so many. Granted, charities accepting clothing donations are nothing new, but it’s reassuring to see that even our stained and damaged clothing can now be diverted from landfill with many retailers and incredibly, even Markham getting involved with and offering textile recycling. There are so many great resources for reselling and recycling clothing- how about footwear? Shoes are something whose wear really shows and they don’t stand the test of time like clothing can… what to do with shoes of all materials when they are spent? Unfortunately there aren’t that many options in Toronto, as far as we can tell, for recycling shoes that are too worn to donate. Markham’s textile recycling program, however, does accept used shoes for reuse or recycling depending on condition.